Want a free copy of R Cookbook by Paul Teetor? You’re in luck, because I have four copies to give away, generously provided by O’Reilly. In case you’re unfamiliar, here’s my review for some background. Bottom line: It’s a fine addition to the O’Reilly series of cookbooks. You know the drill. Simply leave a comment on this post by Sunday, March 8 at 11pm PST. This time around, let’s go with… your favorite number. Yeah, tell me what your favorite number is. Then I’ll choose four winners at random on Monday. Obviously make sure you use a valid email address, and only one entry per person please. Good luck! Update: Winners announced! You should have received an email if you were picked. Thanks for participating, everyone. 7 is my favorite number. Just learning R, so this would be a great help. -6, I am a Cal grad, so I am a bit left of center. 22…days till I’m getting married! My fave number is 4 – it goes with everything. 1, its the most complete (unity) but its also the loneliest. Well, for this contest, it’s either 18 or 82. My favorite number is e. Works so hard, gets no respect. sqrt(-1). Because of our long history together, which has not always been pleasant for either of us. 21. It’s divisible by 7 and 3, among other things. Pretty much win. Is that a parrot on the cover? My favorite number is 4, because that’s the number of people in my family! My favorite number is the Feigenbaum constant, 4.66920… It’s a fundamental number that strangely pops-up in all sorts of apparently unrelated chaotic systems like the Mandelbrot set, Logistic map. 8 is my favorite number. Zero. It’s quite powerful for something with no value. My favorite number of the day would be 4, because I hope to be one of the 4 winners. -0 (a negative zero), because positive zero is just too mainstream. I like pi. It’s delicious. 80085. An early entryway to the visualization of numbers. 1024 = two to the tenth power. nice. π – and pi day is my favorite day. -0, because it was invented by computer scientists. love the stuff on this blog! Agent 99, Barbara Feldon. That is all. I am assuming you meant by May 8th. Because when I was ten, I tried to win the Pick Three lottery by collecting several weeks worth of winning numbers and determining the numbers that appeared most often. 28 had the most hits. I’ve never won the lottery. My favourite number is 42! 4131, my apple of choice. 2, because I already have 2 R books and could use another one. The ever popular 42. Thankfully, it is at random and not for being unique. My favorite is 0. It could never be 7 because as a kid I was told that 7 ate 9 and I have never forgiven it. BTW – thank you so much for your site – I often use your examples of how real world data can be shown (and nicely) as examples of where kids can go with the math that they learn. My birthday date and squares of primes are pretty cool. New to R, would love this book. R these physical books or R they eBooks? Favorite number is 7, but I’m pretty happy with most small integers. What a fantastic giveaway! I have been tinkering with R and would greatly appreciate such a great resource. My favorite number is 5, mostly because of pentagons. 5!!! Lame I know, but I have my reasons. 21, my sons birthday in August. I’m going to join the contingent in favor of phi, the golden ratio. It feels so strong in aesthetics, mathematics, and nature. 200 (at least when I started). Round numbers make me feel good but for bigger, more challenging problems, I like to use R.
Zero. Is there anything it can’t undo? I like 15. And I would love me a copy of the R Cookbook. The SQL Cookbook is very good too. Trying to move from sas to R more this would help! 14. Hopefully you’ll count all of our comments as valid even though we are way past March 8th… though May 8th is right around the corner. 21296. It’s how many days old I am. My favorite number will change tomorrow. I’ve been wanting to learn about R for a while now. Favorite number? Ⅵ It’s not just a s[ie]xy number, it’s a text-editor. There’s something about 144 that works for me. Four sounds like a good number today. It’s the answer to life, the universe, and everything! I like the number 1, since it’s the only number you really need. My favorite number is .. 2. For the number of hours I spent trying to recreate the bubble chart in Excel that I could create on R in less than 5 minutes using your tutorial. Go R! My favorite number is 13, it was the day I was born. My favorite number is the Godel number of the Godel sentence. 4, then 42, and then maybe 24 in that order. So 4 is the favorite. I’m learning R, and I’ve never formally owned a computing book. I’ve never learned how to read a calendar either. So why did this show up on my FB feed today? I’ve never won anything like this, but will give it a try anyway. My wife is learning R for her studies in Forensic Science. If I can get this book for her, it will help bring criminals to justice! Easy, 299 792 458 m/s. So tantalizingly close to 3e8 m/s, but so far away. 29. Why all the prime numbers? It’s pi. Sweet, delicious pi. Ok I will try this again. Fav number 33m. Love the site and view it often. Fantastic and creative. Zero … seems so simple, yet it really had to be “discovered” to make mathematics as we know it possible. Two, because it’s the foundation of everything electronic. My favorite number is -1. Why? Because of euler’s identity formula. My favorite number is 5. Seven, because it makes a filled hexagon. Favorite number is 15. It just seems like a nice level-headed kind of a number. My favorite number is 0.00000001. 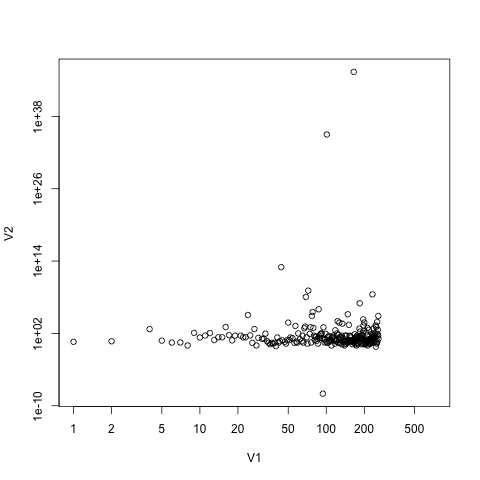 Why –because this is the ding-ding-ding p-value for GWAS..
17 – the least random of the random numbers! 42 is so old fashioned… but then, so am I. OK, 42 it is! Far more impressive than pi from a viz perspective. Because it is the arithmetic mean of comments above mine with less than 10 digits. 17, because it’s the Humbug’s answer to every question in _The Phantom Tollbooth_ and because it is the least random number (according to the Jargon File). R books R awesome ! 436. The number of pages I hope to be reading in my favorite new book. mine is 3.. birth day, lucky number.. and so on..
3,481,704 – the number of holes in the ceiling tiles of the main hallway in my high school. It’s been almost 20 years, but that math lesson has stuck. pi is my favorite number. Did no one else notice that the post says to leave comments by Sunday *March* 8? I think the next year March 8 will be on a Sunday is 2015, so no rush. I like it because if you visualize it, you see a snippet of an interference pattern peaking at the centre with 4. Also, not only is it a palindromic prime, but the sum of all primes before it and this number make a pandigital number! No other sum of continuous primes has this property! Much more interesting than your average rational! My favorite number is i. My favorite number is Euler’s Number (e). It’s got so many nice properties. It’s easy to take derivatives and integrals of e^x. Euler’s number is the main part of the pdf of the exponential distribution, and is part of what makes the distribution so fancy (memoryless distributions, anyone?). Easy, but looks like I’ve been beaten to it 7 times. Best if you’re 11 and using a calculator upside down. 345, because that’s the number of the comment that won! 17, it’s my lucky number! I assume you meant May 8? 11. Prime, visually balanced–what could be better? My favorite number is 219. 33 because that’s how old Tomohiro Nishikado was when he wrote Space Invaders. 10 – It’s so metric, and it was my high school football jersey number. Coincidentally, I just purchased the pdf of this book. But it would be nice to have a hardcopy, so… 7? And that explain why I never win any lottery. My Fav number is 23!! i is my favorite number. 10, but only in sexagesimal. <3 for the sumerians. Hm. It would have to 144. 8 but I’ll change it if I can get a book. I’d have to say 17. 14.. because it was julie foudy’s number. also jerseys for high school teams are usually numbered by size – so there’s no way I would fit into no. 7. Nice book. My favourite number is 13.
why? because it has unique characteristics: no effect on addition and subtraction, reduce to zero any number multiplied by zero, you can’t divide by zero, log(0) ~= negative infinity… zero is a badass number! 1/phi because the digits after the decimal are the same as phi, the Golden Ratio. It’s the same as phi^2, but I choose 1/phi because I really want the R Cookbook. We have a lot of cookbooks that we don’t use, I think I could learn a lot from this one, even if it doesn’t have a cupcake recipe. Wow. People know numbers. Now I regret not paying attention in my math classes..
I’ll go with.. INFINITY (∞). I am a fan of 2. 1989, the year the best decade EVER started to end. By the way I think the date is wrong, shouldn’t it be May 8? My favorite number is 7. Not too original, I know! is just about the coolest relationship ever. 3.14 …. its the basis for everything! 88 is my fav number! My favourite number is …13, contrary to the superstition that 13th day of a month is a day of bad luck. ‘e’ is the natural choice… (groan). 7, but I never did work out why. 667 – the neighbor of the beast. 13 for me,no superstitions since my son was born on the 13th. A very interesting story involving two prominent Mathematicians, and dramatised by Complicite theatre company. Cause that’s what rolled off the fingers. 16 – it’s always been a special number to me because it has so many different facets. It’s the fourth non-zero perfect square. It’s 2^4 -and- 4^2. 1+6 = 7, another lucky number. It’s also my birthday, and that’s four cool things about it times my square personality, which makes 16 – again. It is obvious. My favorite number, an indeed almost everyone’s favorite number is 10. It is the basis of the decimal system and the metric system. Its fantastic. Now if only we could convince birthright Americans that 10 was a really nice number. They tend to prefer numbers such as 12 and 16. The estimated population in 2050… if we get there. e because pi gets all the attention. 14 !! what a number! My fav number is 9!!! Definitely the least random number, 17. I’m doing my masters in Information Systems at UCT (Cape Town). Our lecturers are trying to get us to use proprietary tools but I’ve just discovered R and I like it! 05062011 it is the day you posted the great give away..
8. Day of birth of my first son. Month of birth of my second. One gross. Not a lot of whole numbers are special enough to have their own name. 141 – ain’t prime, but mighty fine. good cooking is central to my tekkie life! 41 because it’s a prime number and the solution to the universe (not 42)!!!! 3. because good things come in 3’s! 1453 because it’s so sad. My favourite number is 3! 8, as made famous by Nintendo! My favorite number is 10, today. For the midfield maestro in me. 27, and I don’t know why. Whenever I have to come up with a number to use as an example, I use 27.
well, I just wanted to make a present to my wife, an infographic designer as well as me!. Thanks! I forgot to mention, my favourite number is 6! I’ve always loved 56. Has a harmony for me. 327 is my favourite number. I’ll go with phi. Call me old-fashioned. 3 because it’s my lucky number! Pi. Because it sounds like ‘pie’. 5 – i’m sure it’ll win! My fav number is 7! 2-because it takes two to make 1. 42, for reasons that should be obvious. My favorite number is probably a googleplex. I’d have to say s(4,2) at the moment, been wrestling with a programming contest entry that revolves around it all morning. My favorite numbers are 3 & 7. 13. It’s my lucky number. 6 and I don’t know why. It was always my baseball number when I was a kid, though. 1 is my favorite number! Been dying to get this book! Favorite number: 22/7, because sometimes I wish the universe were more rational. 7, of course- Born 7/7, weighed 7lb 7oz. My favourite number is 3. Probably. For some reason I’ve always gravitated to 121 – it’s easy to type quickly. 8 – the oct rules – screw the hexadecimal system! Plus on its side it becomes infinite! Favorite number? pi of course. Especially ala mode. Hey Nathan, 7 is my favorite number. Thanks for this giveaway! -40, the point at which Fahrenheit and Celcius temperatures are the same. Do transfinites count? Because then I’d have to go with ω. If not, how about… uh… 24. 2 is my favorite number. Why, 42, of course, in all the geekiest ways! 7 cause it eight nine.